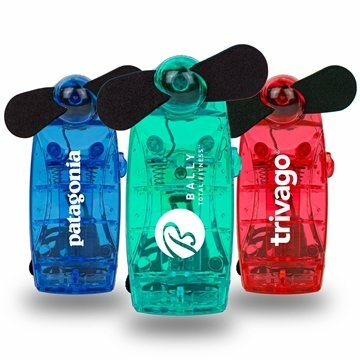 Cool off with a classic mini fan. Battery operated. Comes with soft foam blades. Perfect for any outdoor event. Includes 2 AA batteries packed separately. You have to hold the fan backwards for it to blow on you. I am very dissatisfied with this product. I thought it would be better quality. Great item...we rely on them at our industrial events. speed from order taking to delivery, what we like most. Purchased for teacher appreciation week. Nice little gift, nice message. I would recommend AnyPromo to anyone thinking of gifts or prizes! Quality seemed to be ideal for the cost.